In Constance and Her Friends, by Mary Moynihan, Constance Markievicz and her friends reflect on memories of the 1916 Rising, the Irish War of Independence and Civil War, her time in prison, and the suffrage movement. This work is inspired by the writings of Constance Markievicz, with poetry excerpts by Eva Gore Booth and original testimony including an adaptation from Doing My Bit for Ireland by Margaret Skinnider. 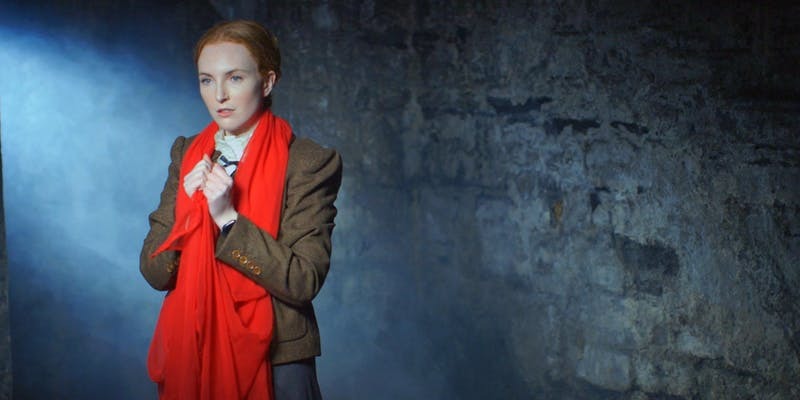 Grace and Joe sees Grace Evelyn Gifford tell the story of her time with Joseph Mary Plunkett, one of the leaders executed after the 1916 Easter Rising and the youngest signatory to the Irish proclamation. It relates how they were married in Kilmainham Gaol chapel seven hours before his execution. Grace reflects on her experiences as a woman in the new Irish state. Written and directed by Mary Moynihan, this piece is based on writings and witness statements from Joseph Mary Plunkett and Grace Gifford, with writing input from DIT Conservatory of Music and Drama actors. It is performed by Carla Ryan. The above event is held as part of Smashing Times: A Creative Celebration of the Centenary Vote for Women which uses creative processes of theatre, film and online digital resources to celebrate the centenary vote for women and to reflect on the experiences of women today in relation to gender equality, human rights, and diversity. The lead artist is Mary Moynihan working with Róisin McAtamney, actor, director and facilitator; Megan O’Malley, actor; Niamh Clowry, Researcher; Freda Manweiler, Producer; and Dr Eric Weitz, Adjunct Professor of Drama, Trinity College, Dublin. The partners are St Paul’s CBS Secondary School; Stanhope Street Secondary School; HACE, Henrietta Adult and Community Education and Mount Temple Comprehensive School. The project is supported by ‘. . . the lives we live’ Grangegorman Public Art; the Grangegorman Development Agency; Dublin City Council; and the Creative Ireland Dublin City Programme 2018 and Dublin City Public Library Archive. The Creative Ireland programme is an all-of-Government five-year initiative from 2017 to 2022, which places creativity at the centre of public policy. Further information from creativeireland.ie and ireland.ie.